The Boston Bruins will be without their leading goal and point producer for at least two weeks. David Pastrnak injured his left thumb Sunday night and underwent a procedure to repair the damages. The repair was deemed successful and the team will re-evaluate the injury in two weeks, according to the Bruins. This is a major injury for the Bruins, something they’ve unfortunately grown accustomed to over the last two seasons. Not only does Pastrnak lead the Bruins in goals (31) and points (66) in just 56 games, he’s also among the league leaders in both of those categories as well. His 31 goals are tied for the seventh-best mark in the NHL and his 66 points put him in the top 10 as well. Pastrnak has been a star in Boston over the last three seasons and has improved every season since his debut as an 18-year-old during the 2014-15 season. He’d score 25 goals and 53 points over his first 97 games between his rookie and sophomore season before exploding for 34 goals and 70 points in 75 games in his contract year. The production was far from a fluke, however, as Pastrnak would score 35 goals and 80 points in 82 games the following season with an astounding six goals and 20 points in 12 postseason games that year. 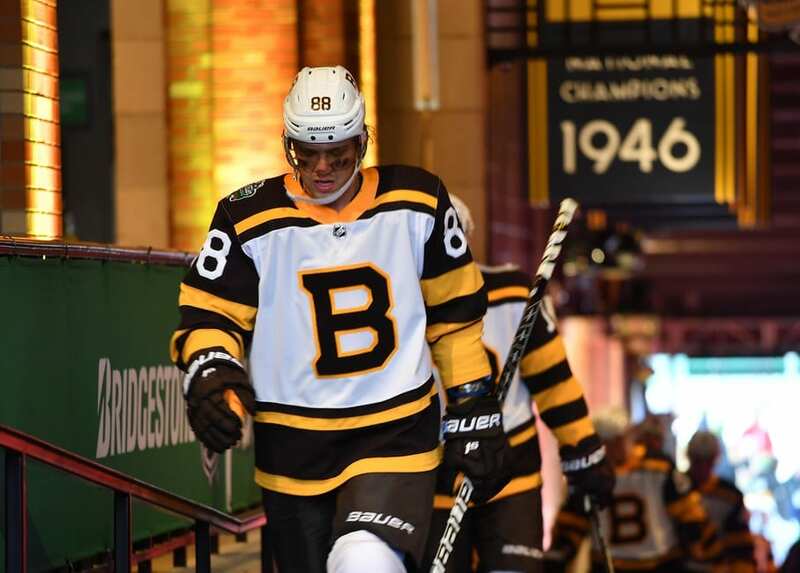 His 31 goals and 66 points in 56 games this season put him on pace for a career year in all categories and even gave Pastrnak a distinct chance at becoming the Bruins first 50-goal scorer since Bruins’ President Cam Neely did so during the 1993-94 season. This injury obviously hurts his chances at reaching that milestone but it hurts the Bruins even more as Pastrnak has been so crucial at five-on-five play and on special teams. The Bruins recently split up their top line of Pastrnak, Patrice Bergeron and Brad Marchand in an attempt to spread the scoring throughout the lineup. Unfortunately, this injury changes things for the team. At their first practice without Pastrnak, the Bruins opted to keep their top line untouched with Danton Heinen skating alongside Bergeron and Marchand. On the team’s second line, David Krejci and Peter Cehlarik remained together with Jake DeBrusk rejoining them on the open wing spot. Despite this major obstacle thrown in their path, the Bruins are not going to sway from their plans heading into the trade deadline, according to general manager Don Sweeney. The Bruins have many options heading into the deadline but the general consensus is that they’ll be major buyers this season with an eye towards a deep playoff run. The Bruins appear to be at least one forward away from legitimately competing though they could benefit from acquiring two forwards in the form of a second-line winger and a third-line center. Whether that ends up being a star player like Artemi Panarin or Vladimir Tarasenko or simply a player like Micheal Ferland is yet to be seen. In the weeks leading up to the deadline, Sweeney will have to decide what type of player he’s looking for and what he’s willing to part with to acquire them.